At the recently-concluded Asia region Feed the Future Agriculture-Nutrition Global Learning and Evidence Event (AgN-GLEE) in Bangkok on March 19-21, Dr. Luke Colavito of International Development Enterprises (iDE) Nepal reported to the 60-plus workshop participants on a new UNICEF-sponsored initiative to expand household availability of “upscale latrines” in rural areas through a market development approach. iDE’s Sanitation Marketing Initiative (SanMark) in Nepal combines its trademark supply chain approach to delivery of low-cost production technology and a “human centered design” (HCD) approach that considers the needs of consumers for useful as well as efficient household products. The resulting “easy latrine” is a lightweight tiled slab with an embedded porcelain pan that combines an aspirational health and sanitation product and a business model with a “one-window” marketing system implemented by sales agents working for local cement product manufacturers. The approach was successfully piloted in 2012 and is being scaled up in 2013 with the support of UNICEF and other donors to reach over 100,000 households (benefiting over 500,000 people) in four Terai districts (Kapilvastu, Rupandehi, Dhanusha, and Siraha) where the practice of “open defecation” is prevalent and known to be a source of contamination of food and water sources and suspected as a contributing factor to “environmental enteropathy” in young children. As described to workshop participants by Elizabeth Williams, team leader for the SPRING Project in Bangladesh, use of latrines and associated hand-washing practices are components of seven “Essential Nutrition and Hygiene Actions” (ENHAs) that are globally promoted by governments, NGOs and the private sector as components of an overall strategy to reduce diarrhea and malnutrition in young infants and children. The iDE “SanMark Initiative” was successfully pioneered by iDE Cambodia with initial support from the Bill and Melinda Gates Foundation. Market analyses indicate that families provided clear and consistent behavior change messaging easily understand the need to use latrines but often don’t have the time and skills to bring together all the component parts and services that are required to construct a usable facility. iDE’s water and sanitation (WASH) experts have designed a durable latrine that utilizes locally available materials – cement, reinforcing steel, ceramic tiles – and costs around $100 including a small brick building for privacy. Consistent with successes iDE demonstrated in a number of countries in the development of low-cost micro-irrigation equipment, SanMark relies on an existing supply chain of cement ring manufacturers for constructing the component and providing “turn-key” financing and installation services. Once the durable latrine floor and holding are installed, households build privacy walls and a simple roof using local skills and materials. 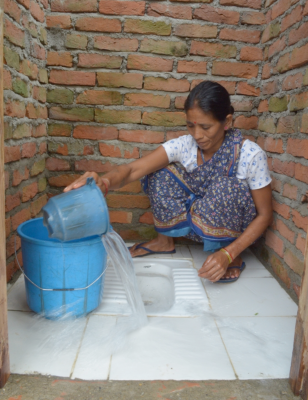 iDE’s new initiative also builds on the desire of Nepalese newly-returned from overseas employment to invest in “up-scaling” their households through a simple investment that meets the sanitation standards they experienced while overseas. The newly designed latrine withstands long-term use and is easily cleaned and sanitized, an important feature for households who are responsive to new learning about the importance of reducing the exposure of children to human wastes. Emerging evidence around the impact of environmental enteropathy on childhood malnutrition and stunting has prompted stakeholders in the US Government’s Feed the Future Initiative to seek to incorporate WASH as a component in program design. iDE’s new Sanitation Market Initiative is a promising strategy for delivering simple, low-cost sanitary facilities to households that complements efforts of FTF country teams to expand the availability of nutritious foods, reducing exposure to environmental challenges that rob children and their mothers of the nutritional benefits of improved diets. Presentations, videos, and related materials from the three regional AgN-GLEE workshops are available on the USAID SPRING project website.